In December 2009, the Birmingham Catholic Primary Partnership transferred £6,000 to the Sisters in Rwanda. This was followed by a further transfer, in February 2010, of £4,000. £6,000 was used to sponsor thirty-five children through their education during the 2010 academic year. At the end of 2009, seven students who have been supported by the Primary Partnership, sat their National Exams. All of them passed and three of the seven have been granted university. In Kiruhura, the practical training courses to help young people with little education, are well under way, thanks to the £3,000 allocation made by the Primary Partnership. Ten girls from the parish have just completed the basketry course. They have become skilled at using a variety of materials, such as dried reeds, bamboo, papyrus and banana leaves to weave baskets. They are now using the techniques learnt, to make every day objects such as bowls, trays and matts. They will continue to develop their skills in other crafts, such as the making of jewellery from beads. The development of these crafts, with their traditional designs, is a way of transmitting part of the richness of Rwandan culture to younger generations. At the same time, by mastering these crafts, the girls have a means of earning a living, as these products are popular both with the local population and tourists. The bricklaying training course has finished and the fifteen boys who participated, are now putting their skills into practice in the building of new toilets for the parish. The group, together with other young people from the parish, also render valuable service in the building, or repairing of houses of those in need. In June, the final course in carpentry will commence and is expected to last six months. In addition to these training programmes, a group of young, disabled people, have started a sewing and knitting co-operative and much of their work involves the making of school uniforms. As a result of the Primary Partnership's generosity, they have been able to replace the faulty knitting machine they were using and they can now produce four sweaters a day with the new machine. In Kiruhura Primary School, part of the Primary Partnership's donation of £1000.00, has helped to provide desks and chairs for teachers. It has also been possible to furnish one of the classrooms that had no desks at all! 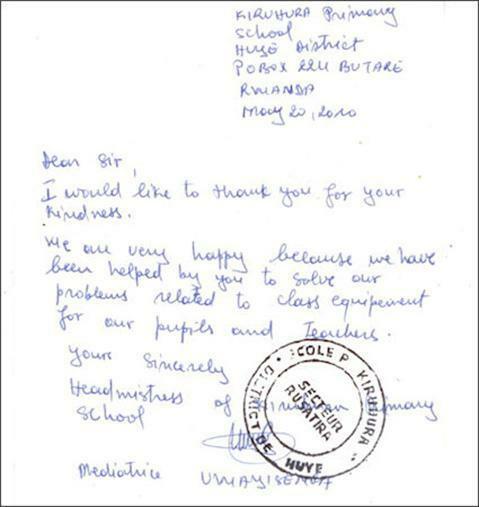 The Sisters in Rwanda always remember our schools in their prayers and in their most recent letter, expressed their deep gratitude to the children in our schools, for the love and care they show for other members of God's family.